Kirsch drapery traverse rods. All rod can be ceiling mount drapery rods or wall mount. Two Way Draw, center opening, Superfine Traverse Rod. Curtain hardware rods. Two way draw Kirsch drapery rods, Extends from 48 to 86 inches, includes 20 slides, 1 support bracket and end brackets. Durable rod for long lasting results. See how to install drapery rods in the support section. Superfine Traverse Rods include drop in brackets, supports and cord tension pulley for installation. Made from heavy gauge steel with a baked enamel white finish. Exclusive Kirlon on all sliding surfaces. Push in brackets and extension plates are available as an option. Only the finest pulley sets are used. Strong and durable with a slide gate for easy removal of extra slides. Long wearing, stretch resistant polyester cord and continuous lacing for use at either end or to convert to a one way draw. Valance rods 28-48" projects 8"
8" projection valance rod fits over curtain and drapery treatments. Curtain rod brackets included, white finish, lockseam construction. Double curtain rods by Kirsch. Lockseam, double, 2" clearance wall to first rod and one inch clearance between rods. Includes brackets for mounting. Uses include double curtain treatment, sheer in back, privacy fabric in front and also used with a curtain with valance. Kirsch basic drapery hardware. White finish. Lockseam, triple curtain rods. A Kirsch curtain rod. Mounting brackets included. Use for triple layer treatments, sheer in back, privacy curtain in the middle and a valance over the treatment. 1 1/2 inch diameter indoor or outdoor curtain rod in 4 foot, 6 foot, 8 foot and 12 foot lengths. Available in two colors in stock, ready to ship. It can be used indoor or outdoor. Use on those windows that face patio or pool area, or use inside on any window. Charleston collection by Design Elements.Note: 12 foot rods have to ship by truck. Call for truck shipping cost. Set with 1" pulley for better performance. Custom sized to your specifications using the 94001 Architrac track by Kirsch. Can use for corner curtain rod installations as two rods butted in corner with one way draws on each. Base price for first 3 feet. Set Includes assembled rod, 94270H wall or 94130 ceiling brackets and 9923 cord tension pulley; longer brackets can be ordered separately. Truck shipping not included on rods over 104" long. Be sure the length rod you order can be transported to your floor. Some elevators and stair cases have length limitations. 1 1/2" Elegance II decorative cafe rods 84-156"
Brass finish. Rods are metal, finials are plastic. Projects 3 1/2 to 4 1/2 inches. Clearance 2 1/2 to 3 1/2 inches. Installing curtain rods is easy! Drapery hardware collection by Graber. Adjustable curtain rods. Projects 3 1/2 to 4 1/2 inches, cafe rod clearance 2 1/2 to 3 1/2 inches. Rods are metal, finials are plastic. Installing curtain rods is easy! Brass finish, drapery hardware collection by Graber. 1 1/2 inch pin on hook. A commitment to quality. Our commitment to quality is steeped in tradition. Whether it's inspiration you seek or innovation you crave, energize your creative spirit with the drapery hardware collection by Graber. 14 per envelope. Using double brackets is an easy way to accomplish a layered treatment for your window. You can hang a sheer curtain on the back rod to allow light in and let you enjoy the view. Use a heaver fabric for the front drapery to block out the light and add to the insulation of the room. This double curtain rod bracket has a 3 inch and 6 inch projection for 1 inch metal pole. It is 3 3/4 inches high (wall mounting profile) by 7 1/2 inches deep (measurement from the wall to the front of the first curtain rod). BasicQ has many other double brackets for other curtain rod profiles. Stock Colors: Black, Antique Gold, Rust. 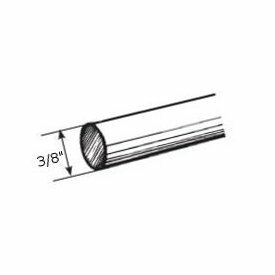 3235-025: Superfine one way right curtain rod set, 100"-180"
2 inch Renaissance finial for 2 inch wood pole. Finials for curtain rods by Kirsch.